The weekends are important to the K-D’s and most of our weekend time together tends to focus around mealtimes. I work Monday-Friday whilst the OH works shifts. I don’t eat breakfast at home during the week and the other half is only around for weekend dinners every other week, so breakfast is our important meal at the weekends. Dexter is a cereal fiend. He loves to pick a 1st, 2nd and 3rd cereal to eat each morning. He’s a focused, determined piggie. Jordan’s Cereal sent us some boxes of their Country Crisp and a bag of granola to try. I’ve always secretly lusted after the Country Crisp range but could never justify spending more than a few quid on a box of cereal for breakfast. The chocolate crisp definitely lived up to my expectations and I found myself muttering “sorry Dexter, this is only for Mummies” until the box was empty. The raspberry crisp was still scrummy but one that I was happy to share with the toddler. I’ve eaten the granola at work and it definitely keeps me full and going until lunchtime. I tried to be versatile with the cereals and make them go a bit further than just breakfast. 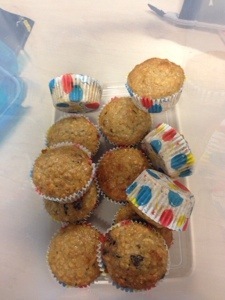 Other than eating them as a snack throughout the day (you try to put a full box down) and munching on them whilst watching a film, I also made some muffins with the Chocolate Crisp and some Flapjacks with the Granola. Method: well, erm, mix it all together and pop in the oven (180c/gas mark 4) until they’ve risen nicely. Method: melt the honey, butter and sugar in a saucepan until the sugar has dissolved. Add the Granola to the mixture. Add the mixture to a baking tray, lined with baking paper. Bake for about 15-20 mins at 180c/gas mark 4. 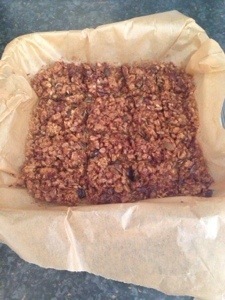 Let the flapjacks cool and then slice. I will definitely be buying the Chocolate Crisp again, purely to feed my new-found addiction, I’m still not sure about sharing though…..
Disclaimer: I was sent some Jordans Cereal to review and share my opinions about on this blog. Everything written above is my own rambling thoughts. We lovely Jordan’s cereal in this house. Laurence’s favourite is the raisin flavour Country Crisp. Just have to watch the sugar content though. Ooooooooh noted! Dex is only really at home at the weekends for breakfast at the moment but it’s definitely something to remember when he starts school.